In early March I went swimming along the coast of Cozumel, an island east of Playa del Carmen, Mexico. The island is close enough to the mainland you can see the tallest buildings on the horizon. 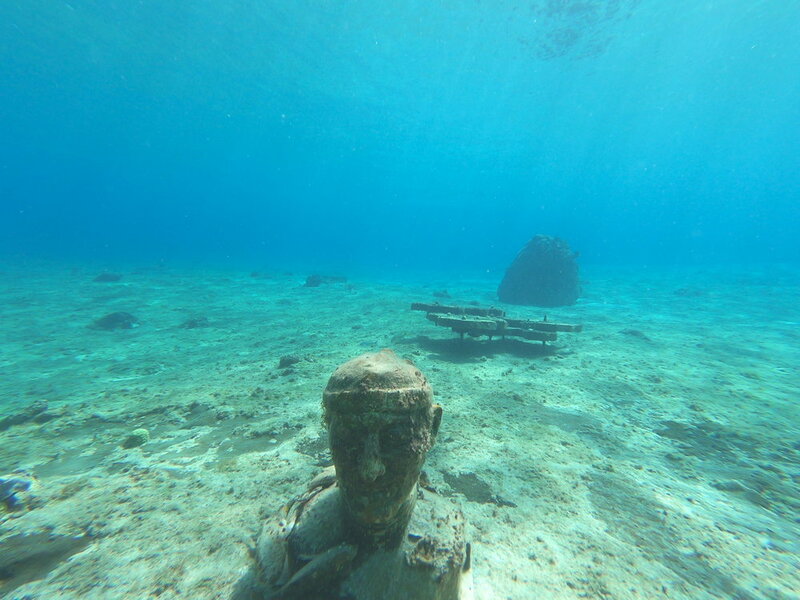 As I swam in 10 meters of water along the shore I was greeted by large, metal boat parts, stone busts and a number of other sculptures strewn across the seafloor. Little did I know that I was getting my first look at some of the future sites of Cozumel Coral Reef Restoration Program’s (CCRRP) coral outplanting program. I dived below the surface often for about an hour in order to capture photographs of what I saw (look to the bottom of the page for more). I was surprised by how many boatloads of beginner snorkelers were dumped into the water while I coasted in the current. Within thirty minutes I had to dive to the bottom to retrieve two lost snorkels and snag three pieces of plastic drifting in the water column. 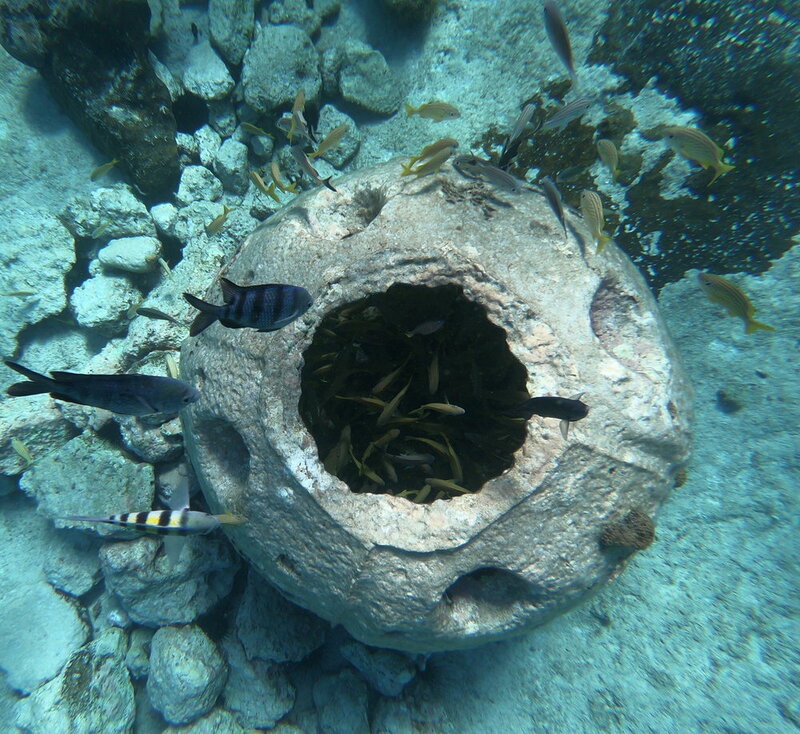 A bio-rock sculpture with coral fragments attached along its frame. The following day, I attended an event called Ocean Talks at the invitation of German Mendez, CCRRP's founder. 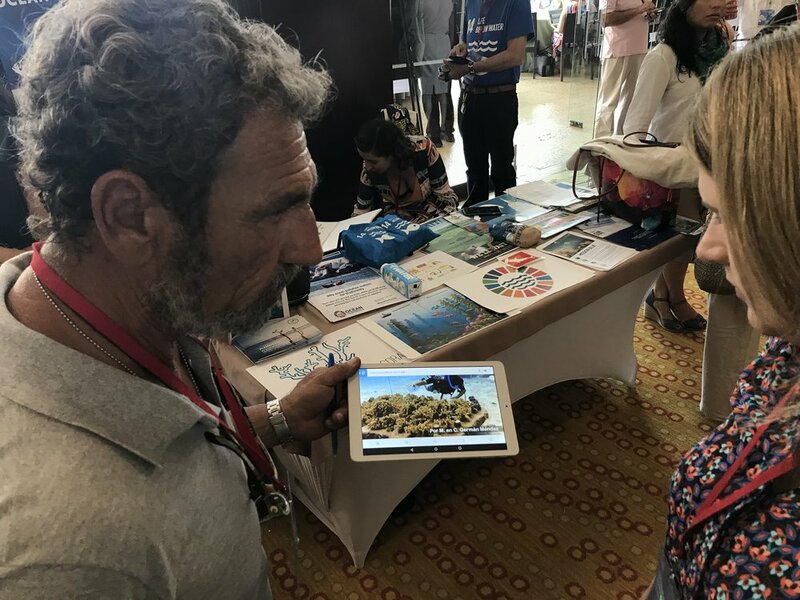 I listened to a long list of speakers, including Dr. Thomas Goreau from the Biorock International Coral Reef Restoration, George Cummings from the World Federation of Coral Reef Conservation and Sam Teicher from Coral Vita who shared solutions to protect our coral reefs. Half were Spanish speaking. I found myself listening intently, wishing I could understand the language and hoping that if Malcolm Gladwell was right, I only needed another 9,998 hours before I could fluently understand it! I left the event feeling more concerned than optimistic, which was a good precursor to the optimism that pervaded the Economist World Ocean Summit (WOS) later than week. German tending to his coral nursery. German Mendze first moved to Cozumel 30 years ago and fell in love with diving. Not long after, tourism development began in earnest and he watched the reefs he had fallen in love with start to deteriorate. In 1994 the Cozumel government approved the development of cruise ship piers inside an existing marine protected area, shifting the MPA boundaries five miles south. Despite organized opposition, the project went forward. Spurred by this loss, German got his masters degree in marine biology at Florida State University and visited reefs throughout the Caribbean. When he returned to Cozumel, he surveyed the local reefs near the port and found 97% of the coral had died in his absence. He formed Cozumel Coral Reef Restoration Program (CCRRP) in 2013 to educate the public about what is happening and how to restore them. The main outplanting area is between the Farm and cruise ships, though they will start transplanting to the new concrete Reef Balls (right) that I pictured earlier. German sharing his project with Sara Otterstrom from Paso Pacifico at the World Ocean Summit. Six days after Ocean Talks, German and Carlo Sanchez, a CCRRP volunteer, gave me a personal tour of Cozumel Coral Reef Restoration's underwater coral nursery. After listening to major corporations and foreign governments pay lip service to concepts of large scale marine protection at the World Ocean Summit, it was clear that translating such talk into action on the ground is more difficult. CCRR's nursery (map above left) is located in a relatively developed part of Cozumel island where souvenir shops, restaurants, and hotels cater to American and European tourists. While we got on our wetsuits, German expressed his frustration with the big cruise-ships docked at the nearby pier. Since the pier's expansion ten years ago, the port has become the most popular cruise ship destination in the world. Unlike the image above, the nearshore cruise ships tend to back into the pier, which stirs up a lot of sediment negatively affecting the coral nursery and outplanting areas. This requires them to spend a lot of extra time cleaning the restoration sites to keep the coral healthy. It was clear that tourism has had a heavy impact. In the hour that we spoke before diving, seven boatloads of snorkelers jumped overboard and a four dozen scuba diving students waded from shore and into the deep. Most of them were likely wearing sunscreen that is poisonous to coral colonies and had little idea about the damage below the surface. Cozumel is in the northern part of the Mesoamerican Barrier Reef, which extends for 600 miles along Mexico, Belize, Honduras and Guatemala, and is the largest in the Western Hemisphere. The Mesoamerican Reef is so ecologically diverse and important that Mission Blue designated it as one of its one hundred Hope Spots - marine habitats that deserve the highest priority for global conservation. Scuba diving is the main tourist attraction on the island, which is also most popular diving location in the world, so its also a very important location to educate visiting divers about its importance. The problem is that most people don't know what's happening to the reefs. Their perceptions are limited by what is called shifting baselines: newcomers are amazed by what the see under the surface, but compared to twenty years ago, they are diving in a desert. Meanwhile those that have dived for decades watch as the paradise they once remembered is lost. "So many people get trained in scuba right next to the nursery but have no idea that its here," said German. He is reaching out to local dive shops to help train their diving instructors who they can pass that knowledge onto students. In addition, he is collaborating with the Professional Association of Scuba Diving Instructors (PADI) to offer a Coral Restoration Diver Specialty so that scuba divers can get trained in coral growing and restoration techniques. German is the first to admit that while he has a strong cadre of loyal volunteers, we will need many more to bring the local reefs back to health. After listening to world business and philanthropic leaders talk landscape scale conservation in conference halls and meeting rooms, it was refreshing to be be underwater learning about CCRRP's restoration program. As a relatively new diver, its hard to put into words how I felt as I helped outplant a coral fragment onto CCRRP's reef. I hope more of you out there will choose to visit him as well. When we returned to shore after diving, we were approached by a 2o-something man who said he wanted to help. When German found out that he didn't know how to dive yet, he dedicated the next three hours to teaching him how to scuba for free. Now that's heroism I can aspire to. An assortment of underwater installations.